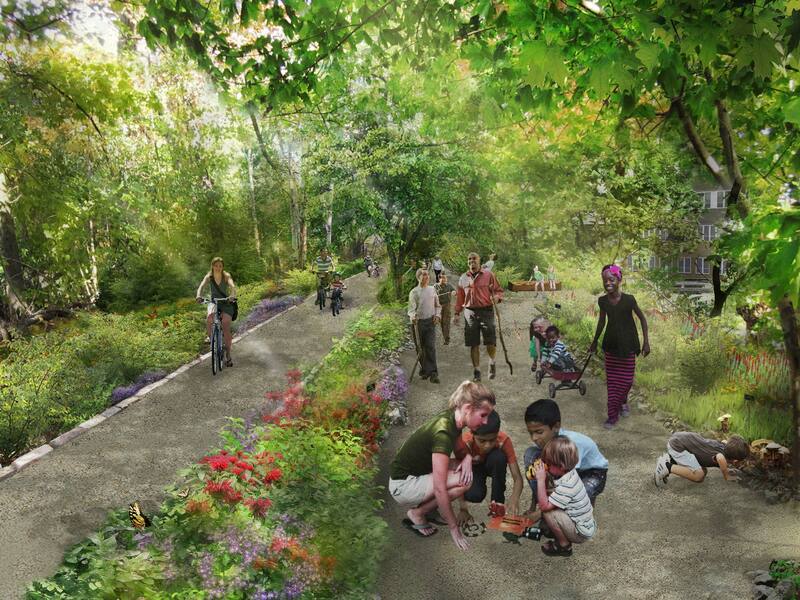 The QueensWay will provide for the needs of all ages and abilities, including several ramped entries, comfort stations at the four main activity areas, and benches along the QueensWay for resting points. The path will be carefully designed to avoid conflicts between walkers and cyclists. This approach will include a number of long stretches where the path will separate for the two modes of movement. There will be key locations designed for access for emergency vehicles. The QueensWay is designed to maximize safety and privacy for neighbors while also being open with good visibility for park users. There are two lengths of the QueensWay where streets run parallel to the park. A number of design measures have been developed to screen and secure backyards and homes from the QueensWay. The pathways that run by homes are designed with vegetated buffers at the top of the embankment as well as secure fencing at the property line to physically and visually separate backyards and homes from visitors. The fencing will have plantings along it to provide additional screening. Where the QueensWay embankment is near private homes, the pathway can be lowered by excavating the embankment, decreasing any visual connection between the QueensWay users and adjacent homes. In addition, all activity spaces are located away from adjacent homes and sited near existing non-residential amenities and highly-used public thoroughfares.  The two lengths of the QueensWay that run by homes, referred to as the “Passages” will be used for walking and cycling.  The drawing above highlights a typical cross-section of the “Northern Passage,” which is parallel to Alderton and Selfridge streets.  The drawing above highlights a typical cross-section of the “Southern Passage,” which is parallel to 98th Street. On the east side of the QueensWay, streets dead-end into the park, resulting in the sides of some houses facing the QueensWay. The planted fencing and design of the QueensWay will also help to prevent the erosion of the embankment into the adjacent backyards, which is a common occurrence in this area. To ensure safety and security for neighbors and park users, the QueensWay will have gates at all entrances. The QueensWay will close at dusk except during winter months, when it will remain open slightly later to accommodate commuters. NYC Parks “Police Enforcement Patrol” (PEP) officers will be hired to patrol on bicycles. PEP Officers are empowered to issue summonses and make arrests, and coordinate closely with local police. Video cameras can be installed. Specific locations for security cameras, and monitoring protocols will be determined at the final design phase for each QueensWay section. Lighting strategies will be developed to minimize light pollution for neighbors while focusing light along pathways for the safety of park users. Lighting at activity spaces will be designed to ensure wide visibility across the park, and the Elevated Zone may employ additional lighting to allow for walking and other activities during evening hours. The rail line trestles will be illuminated and reused as lighting structures along the length of the park. In the passages, lighting will be lower in height and more focused on pathways. Lighting at entrances will be positioned and designed to draw visitors to the QueensWay.